Remember how I said my Grandmother’s stuffing was one of the first recipes of hers I got? Well this is the very first one. Porlos testa (TEE-sta). Nothing says Christmas to me like these “cookies.” I suppose they’re more like a pastry but growing up they were my favorite, and still are. These were really special because they were only made at Christmas. Kinda like egg nog. And it seemed like everyone in her family made them. I’d get them at her house, at my great-aunt and uncle’s house where we had Sunday dinners, and at home because my mom learned how to make them. There’d be two kinds of these Hungarian treats. One would have a cheese topping and one would have a prune/plum lekvar topping. My mother’s transcribed recipe mentions apricots so I suppose that was also used but I don’t recall ever having any. The cheese ones are my favorite. They are extremely dense but delicious. When you cut them up, make sure you cut them into smallish pieces. They’ll keep for a while in the fridge and just like my grandmother’s stuffing these are also a great hit. Cheryl brought some to her office last year and the plate was empty in 15 minutes. Even though I prefer the cheese ones both are really good with a cup of coffee. This is enough dough to make one big pan (13×9) and one small pan (8×8) and have strips of dough for the top. 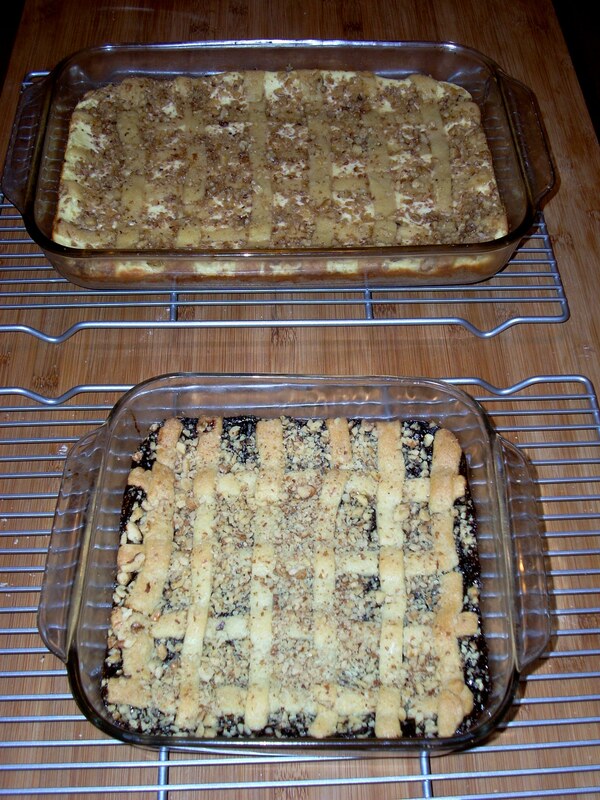 I make the cheese ones in the big pan and the prune ones in the small pan. Cream shortening and sugar thoroughly, then add beaten egg yolks. Mix well. Sift flour and salt with baking powder. Alternate adding flour and sour cream to the mixture. Mix well. Add lemon extract. Form into a big ball cover with plastic wrap and chill in refrigerator for an hour. Combine ingredients in bowl and mix well. Butter/grease a 13×9 baking dish. Take dough and spread out in dish to ½ inch thickness. You can roll it out and place it in or press it into the dish with your fingers. Spread cheese mixture onto dough. 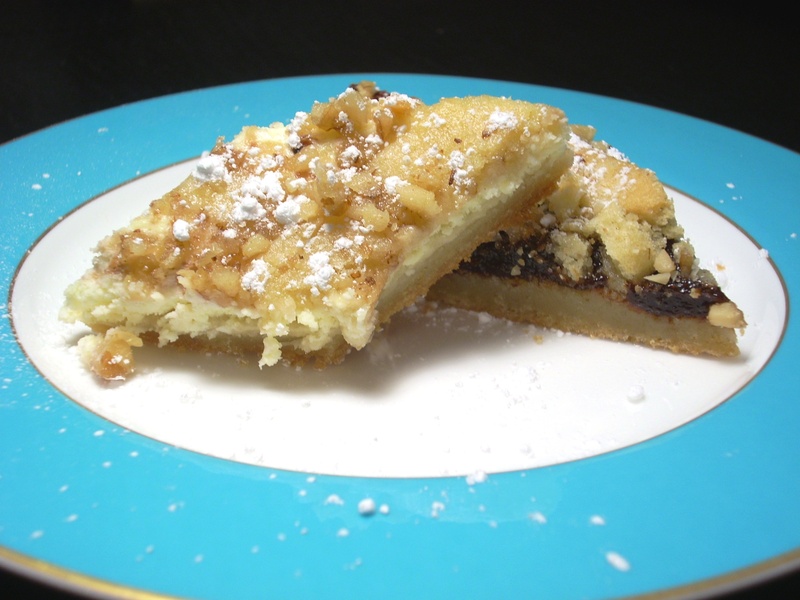 Repeat with the 8×8 dish, open up the can of lekvar and spread on top of dough. 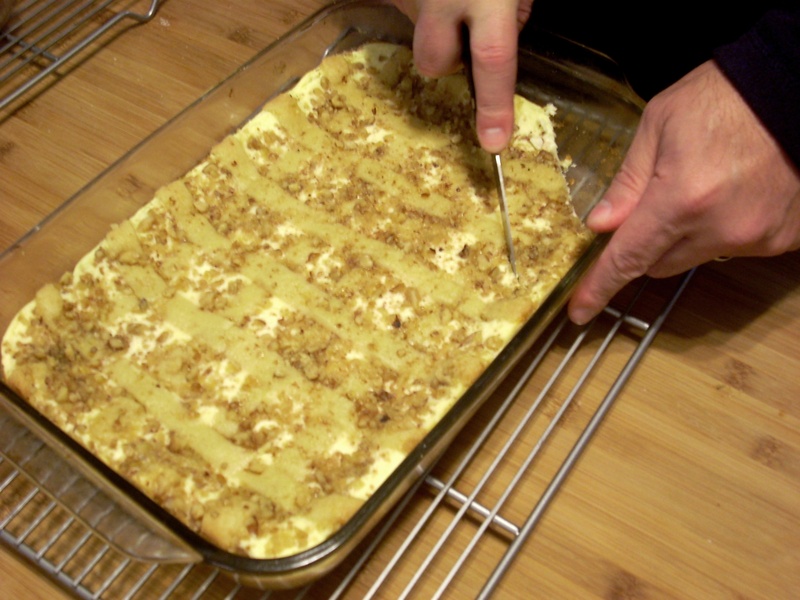 Roll out some of the remaining dough and make strips to place in a criss-cross pattern on top of the filling. Bake at 350°F for 50-60 minutes or until done. Cool and cut into diamond sections. Dust with confectioners sugar. These go great with coffee or tea. Oh that one!!! That’s not the one I thought you meant…I thought you meant the rolled up ones…do you have that recipe? If not I will send it to you…these were yummy too! You know, I don’t think I have the recipe for those. I like those too!